Welcome to the new look hobby news. As I blogged about at the end of last year, I am now only reporting on hobby news once a week on the blog, in a weekly round-up on the Friday of each week. This week has obviously been a little quiet as companies are coming back to work after the Christmas period, but a few things did catch my eye. Whilst it is a very great shame that Mike Broadbent’s original 28mm Teddy Bear’s Picnic range is no longer available, it seems that he has not abandoned the idea of historical gaming with Teddy Bears. 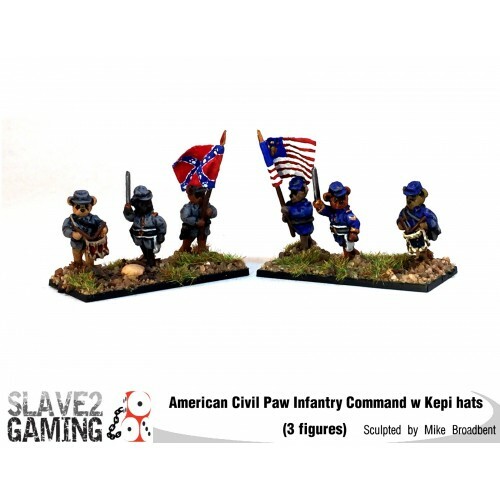 Slave 2 Gaming have just released a new range: Battle of Teddysburg – The American Civil Paw. Needless to say, this is a sideways look at the American Civil War, with the two protagonist armies depicted by Teddy Bears in uniform. The miniatures are 18mm tall, and the range currently has 24 packs, including Infantry, Cavalry and Artillery all in either hats or kepis. This looks like a wonderfully whimsical range – I just love how the cavalry are all on hobby horses! – and if ever I was going to build a couple of ACW armies for Sharp Practice 2, then I would be sorely tempted by these (even though I expect the cost of shipping and import tax to the UK to be high). If you wanted to look at the dedicated rules for this range, the beta version is currently at Wargames Vault. Talking of Wargames Vault, Legionaire Games – the company behind the Strike Legion sci-fi rules – have just published a set of Fantasy mass-battle rules called With Sword and Shield. Strike Legion was quite an interesting set of rules, so I’ll be talking a closer look at With Sword and Shield in the near future. Saxon Miniatures recently posted a new picture of armoured cavalry on their Facebook Page. These look really nice, and will probably arrive just in time for the release of the Aetis & Arthur supplement for Saga, which is due out at the beginning of February. At time of writing Warlord Games still have their Terminator: Genisys game on sale for £20. Whilst I have no idea of the sales figures, the fact that this game is at bargain bin prices (and that most of the figures on the website are out of stock) may well mean that this game has bombed, and Warlord are just clearing stock of the game. However, if you are a Terminator fan, this box is probably worthy the money, just for the miniatures. This looks to be a good deal, though get in quick as everything is selling fast.